insane | મનોમંથન પાગલ મનનું..! A person who dare to stand against the Face of Power & Money also Holds his true statement till his last breath. Its the true story of war between unknown poor honest boy and a well known Rich Face. who can buy justice for own survival. A young boy from Satara, Patil joined the Mumbai Police as a constable and was trained as a commando to join the Special Operations Squad (SOS) which has a primary duty of guarding VIPs. In, 2002, Patil was assigned duty as Salman’s bodyguard. On the fateful night, Patil was traveling in the SUV with Salman behind wheels. Immediately after the accident, Salman vanished from the spot, while Patil rushed to the Bandra police station – to fulfill his duties as a citizen as well as a policeman – for the first information report (FIR). Patil gave his statement to the police based on which the FIR was registered. He later stood by his statement in the court at the time of trial. The prosecution had earlier claimed that Patil’s statement has been the single-most important piece of evidence but now has dismissed his statement after his death. On the night of the incident, Patil probably would not have realized what was in store for him. He could not have imagined that just by being in the car at the time of the accident and performing his duties would cost him so dearly – eventually his life. The Bandra police finally managed to arrest Salman based on the statement given by Patil that the actor was driving the SUV at the time of the accident. Patil’s woes had just begun. Being a ‘prime witness’ in a high-profile case, Patil was removed from his duties as an SOS commando. People close to him maintained that Patil was under increasing pressure to retract his statement given to the police. Even though it was never revealed who was pressurising him, it was clear that tremendous pressure was being put on Patil – he was physically and mentally crumbling. Being a low-rung constable in the mighty Mumbai Police did not help Patil, because he was also tactfully isolated by his own department. He started abstaining from duty and would spend time away from Mumbai. During the trial, it was clear to everyone, the only solid evidence that the police had, was Patil’s eye-witness account. There were a total of 27 witnesses in the case, but Patil was the prime witness who could turn the case around. However, when it was Patil’s turn to give his testimony in the court, he disappeared. Those close to him said that since he was isolated he did not have the courage to stand in the court. Many felt, that, it was the Mumbai Police which should have stood by him, ensured that being a prime witness and a policeman he should be protected. But, none of that happened and Patil continued to stay away from court. In fact, when he disappeared, a missing complaint was also filed by his brother. Rumors started doing rounds that Patil was being pressurized to stay away from the trial. Things took an ugly turn for Patil when the court did not appreciate the fact that he was staying away from the trial. His absence was delaying the already delayed trial. When the police were asked about Patil’s whereabouts, the court was told that he had gone on leave without informing the department. Based on this information, the court issued a warrant against Patil and ordered the police to arrest him. Mumbai Police dealt a double whammy to Patil by dismissing him from service on the charges of going on leave without permission. When Patil was finally found in a hotel in Mahabaleshwar, his very own department promptly arrested him and he was sent to jail. Here again, Patil may have never imagined that he would be arrested in the very case in which he was a complainant and had himself registered an FIR. Ironically, when Patil finally deposed in the case in March 2006, he was still in jail. One can only imagine what must have gone through a policeman who is a trained commando but ended up in a dingy cell of Arthur Road jail in a case in which he is a prime witness. After being released from jail, Patil again went missing. No one, including his family, knew where he was. There are reports that he had gone to his mother’s place in Dhule district. In the interim period, he was dismissed from the police department. This meant that his salary was stopped and he was left without any job. He even reportedly got divorced from his wife after being released from jail. Patil later even claimed that his family had abandoned him. In September 2007, months after he had gone missing, Patil was found in the Sewri TB hospital. Such was his physical condition that at first no one recognized him nor did anyone know that he was the main witness in the Salman Khan hit-and-run case. He was reduced to a pile of bones and weighed a mere 30 kg. He was diagnosed with a deadly type of TB with little hope of survival. According to the hospital staff, Patil had reached the hospital in a pitiable condition and was unable to move or even speak. Patil had reportedly told the doctors that he was begging on the streets of Mumbai and had managed to collect Rs 50 to hire a cab to come to the hospital. Doctors said that due to the enormous stress that Patil had undergone in five years, his body was unable to take pressure any further and he had developed a strain of TB which had turned fatal. He lost the battle for his life on October 4, 2007. Barely a few days before his death, Patil reportedly told a section of the media that the accident had destroyed his life. The Court delivered judgement in favor of so called FILMI HERO. 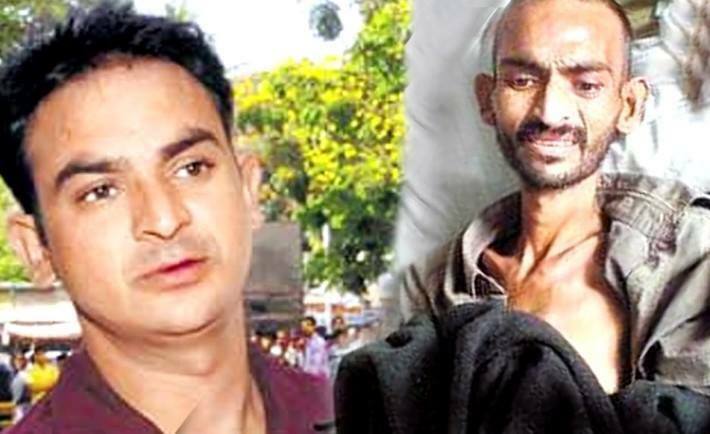 But, the deceased real hero Ravindra Patil still awaits justice. Raise Your Voice for Him. Holds the truth till Death makes him The Real Hero. રાત્રીના બરાબર ૧૨ વાગીને ૩૩ મિનીટનો સમય થયો છે અને ઘરના ઓરડાની બારી માંથી પાછળની ગલીમાં ફરતા ઉંદરોનો અવાજ સંભળાઈ રહ્યો છે. એમના શોરબકોરથી લાગે છે કે આજે કોઈ પાર્ટીનું આયોજન છે અને બે ચાર ઉંદરોનો પરિવાર ભેગો થયો છે. કદાચ પાછળ રહેવા વાળા માસીનું જમવાનું વધ્યું હશે એટલે આજે એમની કચરાપેટી આ ઉંદરોની પાર્ટીનું આયોજન સ્થળ બન્યું. રાત્રીની આ નીરવ શાંતિમાં એમના ચૂં..ચૂં.. ના અવાજમાં ઊંઘ આવે એવું લાગતું નથી અને હું વિચાર શૂન્ય થઇને બેઠો જ થયો છું પણ કોણ જાણે કેમ મને ૧૨ વર્ષ જુનો હાઇસ્કુલનો પેલ્લો દિવસ યાદ આવે છે. વિજ્ઞાન પ્રવાહમાં રસ હોવાથી અને અમારી શાળામાં ફક્ત સામાન્ય પ્રવાહનું શિક્ષણ હોવાના કારણે ગામની બીજી શાળામાં ધોરણ ૧૧ વિજ્ઞાન પ્રવાહ માં પ્રવેશ લીધો. બાળપણથી જ સપનું હતું કે ડોક્ટર બનવું છે એટલે નઈ કે મને ડોક્ટર બનવાનું ગમે છે પણ એટલે કે મારી મમ્મીનું સપનું હતું કે એનો દિકરો ડોક્ટર બને. પણ મને વિશ્વાસ હતો કે હું મારી મમ્મીનું આ સપનું પૂરું નઈ કરી શકું, માટે મેં જીવ વિજ્ઞાન અને ગણિત એમ બંને માંથી એક વિષય પસંદ કરવાને બદલે મેં બંને વિષય પસંદ કર્યા. એટલા માટે નઈ કે હું ઘણો હોશિયાર હતો પણ એટલા માટે કે કદાચ ડોક્ટર ના બનીએ તો બીજો રસ્તો ખુલ્લો રહે. જેમ તેમ કરીને એક વર્ષ પૂરું થયું અને પરિણામ આવ્યુ રિપોર્ટકાર્ડ જોઇને લાગ્યું કે જીવ વિજ્ઞાન વિષય છોડીને સારું કર્યું. હવે ૧૨ માં ધોરણમાં હતા, બોર્ડ હતું એટલે બધી બાજુ થી ટકોર થતી કે આ વખતે બોર્ડમાં છો તો વાંચવામાં જ ધ્યાન રાખો. અને મજાની વાત તો એ કે જે લોકો ૧૦ પાસ નથી કર્યું એવા સલાહ આપવા પેલ્લા આવી જાય અને એમના બીજા સગા સબંધીઓના ઉદાહરણ આપશે કે મારા ભાઈની સાળાની છોકરીના આટલા આવ્યા હતા ને મારી બેનના નણંદના છોકરાના તેટલા આવ્યા હતા. જોકે આમાં એમનો કે એમના જેવા લોકોનો વાંક નથી પારકી પંચાત તો આપણા ગુજરાતીઓના લોહીમાં પહેલેથી જ હશે. I have not any experience of blog writing but, I’d tried to write this without think about what readers think about my writing. Here, i consider my self as a insane person Crazy one. Thus i don’t care what people thinks and tells about me. I would like to share insane ideas and interesting things with you all and also want to know your views and opinion. so, lets become crazy over here.. And Share our craziness with others.